Our Mission: "We exist to provide a safe haven for all to worship Christ and grow together in faith. Click HERE to view a copy of the Bylaws for the Ebenezer Moravian Church. The Board of Elders consists of five members of the congregation and the Pastor. They are charged with the spiritual well-being of the congregation. They see to it that the worship services, the proclamation of the word of God, and the sacraments of baptism and Holy Communion are regularly and faithfully dispensed according to the rituals of the Moravian Church. The Elders oversee the religious nurture of all members of the congregation. When not provided for by synod, they determine what offerings shall be taken for causes outside the congregation. They also appoint musicians, head usher, and oversee other ministries and assistants as may be necessary for the spiritual care of the congregation. The Board of Trustees consists of five members of the congregation and the pastor. Each Sunday a Trustee and at least one other person shall receive and record the receipts of the congregation showing that the receipts match the deposit. They have control of all permanent funds of the congregation and exercise the greatest care to invest all funds safely. 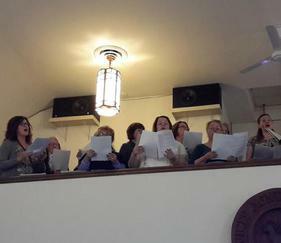 The Trustees strive to see to it that sufficient funds are raised to support the congregation. They are responsible for keeping all church property, including the church premises, in good repair, and in an attractive condition. In this capacity, the Trustees are responsible for maintaining the physical structures and properties. Ebenezer Moravian Church was established in 1853 making us 163 years of age. Additionally, we are the oldest containing Moravian Church in southern Wisconsin. 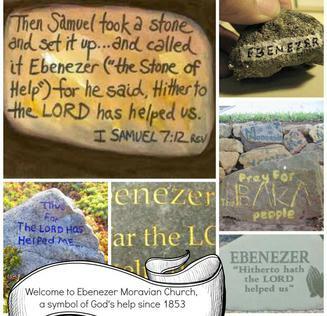 Our Name sake make be found in the scripture, specifically in 1 Samuel 7:12 which is a stone monument erected to symbolize the Help of the Almighty God. Today, Ebenezer continue to seek Christ will for our purpose in our community and in our world. We have many ministry opportunity for members to get involved in the life of the church as well as in the life of our community and the world around us. Visit of "Get Involved" to learn more about ways in which you can help to make disciples of al nations, freed the hungry, clothes the naked, visit those in prison and more. For as much as we do these to the least of these we do it to Christ. "We exist to provide a safe haven for all to worship Christ and grow together in faith." New pictures are coming and will be posted soon.